Entrance fee to any monuments/ National Park or camera fee. On arrival our representative will greet you at Cochin airport and then transfer to the hotel. Check-in and relax for a while amidst the comforts of your room. Overnight at the hotel. Morning drive through the Western Ghats to Thekkady (approx. 150kms / 04hours), a beautiful area of tea gardens, rubber estates and coffee and pepper plantations, located high in the Cardamom hills. Upon arrival check-in at the hotel and relax for a while amidst the comforts of your room. In the afternoon, visit a spice garden where you will be introduced to different spices and shown how some of the spices are grown. Overnight at the hotel. In the morning drive to Kumarakom (approx. 115kms / 03hours), en-route you will visit a working tea estate, where you will have the opportunity to learn how tea is grown, graded, the various processes involved in the production of tea and an introduction to tea tasting. Continue drive to Kumarakom and check-in at the hotel. This is an enchanting backwater destination of Kerala. Spread over a cluster of islands on Vembanad Lake, Kumarakom is pictured as a mesh of lush tropical waterways and low-lying paddy fields. Rest of the day is free for leisure walk and explore your surroundings. Overnight at the hotel. In the morning visit Kumarakom Bird sanctuary famous among Eco tourist as the home of migratory birds. Later drive to Alleppey (approx. 35kms / 01hour). Here we will board our houseboats and begin our journey into the network of the Kerala backwaters. The traditional houseboats are simple vessels, with en-suite twin rooms. The pace is relaxed - enabling us to see riverside village life in its entirety. The industrious villagers survive on narrow spits of land, keeping cows, chickens and cultivating vegetable gardens. Even the shells from the fresh water mussels are burnt to make building lime, and the fibre from the coconut palm has many uses including Coir products made from coconut fiber. The gardens are generally well tended often with brightly colored flowers, such as hibiscus, contrasting sharply with the tropical greenery. Lunch, Dinner and overnight on houseboat. Morning after breakfast disembark the houseboat and drive to Cochin (approx. 50kms / 01hour). Cochin has been a gathering place of merchants since antiquity and is full of bustling traders. A half day tour is planned for you which includes Fort Kochi which is the oldest European settlement in India (1500), and has a mixture of English, Dutch and Portuguese influence. The Mattancherry Palace was built by the Portuguese in the 16th century, but extensive renovations by the Dutch some hundred years later earned it the name the Dutch Palace. It has some of the best murals in India, depicting scenes from the Ramayana and other great legends. On our tour we visit the Jew town synagogue where Kochi's surviving Jewish community come to worship. Nearby are the interesting cantilevered Chinese Fishing nets. In the early evening we see a performance of Kathakali, which is thought by some to be the very essence of the culture of Kerala. Its origins may have come from traditional temple rituals and from an art form known as Koodiyattam. It is the face make up which makes this dancing so unique. The dancers can take up to three hours painting their faces - the features are heavily emphasised as it is the facial expressions and coordinated eye movements which are important in the dance. The dances usually portray events from the Ramayana and Mahabharata, great Indian epics. Overnight at the hotel. Morning after breakfast transfer to the railway station to board train for Coimbatore. Upon arrival drive to Ooty (approx. 80kms / 03hours). Upon arrival check-in at your hotel and relax for a while amidst the comforts of your room. Later proceed for Ooty sightseeing, major attractions of Ooty are Botanical Garden, a stylish garden bordering immense variety of flowering bushes, flowers, plants, fern house with a vast range of ferns and orchids, a clear pool are some of the highlights of this garden. "The Dodabetta Peak is located at an altitude of 2,623 meters and is the highest point of Nilgiris hills. Overnight at the hotel. After having the breakfast, proceed for the sightseeing of Coonoor, the place surrounded by the tea plantations. The major attractions are Pasteur Institute, just opposite to the Sim's Park. Lamb's Rock is just 08kms from Coonoor and on the way to Dolphin's Nose. Laws Falls is a beautiful picnic spot, situated at Coonoor-Mettupalayam road at a distance of 07kms from Coonoor. The height of the falls is about 180 feet's. It is just a paradise for Nature lovers. Overnight at the hotel. Morning after breakfast drive to Mysore (approx. 150kms / 04hours). On the way you can watch Bandipur Wildlife Sanctuary, Mudumalai Wildlife Sanctuary along with Kalhatty Waterfalls. Upon arrival check-in at your hotel and relax for a while amidst the comforts of your room. Morning after breakfast, proceed to visit the sprawling Maharaja’s Palace with its outstanding treasures and ivory inlaid doors. Also visit St. Philomena’s Church, a beautiful Cathedral reminiscent of Medieval Architecture with stained glass Windows and lofty Towers. Explore your evening by proceeding to Brindavan Gardens which is one of its kinds in the country and located 19kms from Mysore. This ornamental garden is situated at the base of Krishnaraja Sagar dam across Cauvery River. Overnight at the hotel. Morning after breakfast drive to Hassan (approx. 190kms / 04hours) enroute visiting Belur and Halebidu. Belur, a temple town famous for its exquisite temples. It is also known as Dakshina Varanasi. King Vishnuvardhana built the Channakeshwara temple in 1117 AD to commemorate his conversion from Jainism to Vaishnavism. The star shaped homogeneous architectural beauty raised on a platform carved in black stone with 650 charging elephants that are different from each other and in the temple dome inside four famous figures of Shantala Devi’s voluptuous beauty, queen of King Vishnuvardhana are marvelous. Halebidu is also known as Dwara Samudra, the wealthy capital of Hoysalas. The Hoysaleshwara temple stands on a platform like a casket in shining black stone carved with variety of gods and goddesses, animals, birds and dancing girls. There is a museum on the lawns with 12th century sculptures and gold coins in use at that time. One km from Halebidu is Jain Basti hill built in the 8th century surrounded by gleaming carved black stone pillars. Return to the hotel for overnight stay. Morning after breakfast drive to Hospet (approx. 320kms / 06hours). Hospet makes for an appropriate base camp as it offers a wide range of hotel options. Upon arrival check-in at your hotel and relax for a while amidst the comforts of your room. In the evening you may visit Anantashayana temple located at the eastern fringe of Hospet. Overnight at the hotel. After breakfast visit the popular Tungabhadra Dam and other major tourist attraction of Hospet covering Royal Place, Lotus Mahal, Vittala temple and the Archaeological Museum. Later drive to Hampi (approx. 30minutes). Hampi is the World Heritage Center and the most beautiful and evocative of all the ruins of Karnataka. Capital of Vijayanagar kingdom is full of delightful surprises, viz., Kings Balance where kings were weighed against grain, gold or money which was then distributed to the poor, other attractions are Queen's Bath with its arched corridors, projecting balconies, Lotus Mahal Vittala Temple, Virupaksha Temple, Ugra Narasimha are not to be missed. Upon arrival check-in at your hotel and relax for a while amidst the comforts of your room. Overnight at the hotel. The best way to experience this World Heritage Site is to take a leisurely stroll through the eloquent ruins. Most of the important structure and ruins are located in two areas, which are generally referred to as the Royal Centre and the Sacred Centre. The Royal Centre contains structures that seem to have been palaces, baths, pavilions, royal stables, and temples for ceremonial use. The sacred center is situated on the banks of the holy Tungabhadra River. Visit Vittthala temple and Virupaksha temple. Overnight at the hotel. Morning after breakfast drive to Badami (approx. 145kms / 03hours). Badami was the royal capital of Chalukyas, The city is the house for large number of cave temples, entryways, fortresses and carvings. Upon arrival check-in at your hotel and relax for a while amidst the comforts of your room. 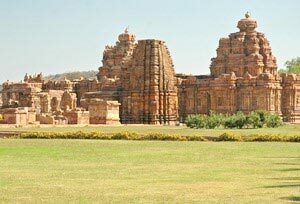 Later start sightseeing tour of Badami which includes attraction like Badami Fort, Open Air Museum and the Cave temples. The Badami cave temples are a complex of temples, considered the finest example of Indian rock-cut architecture, especially Badami Chalukya Architecture. Overnight at the hotel. 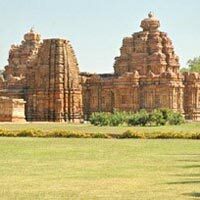 Morning after breakfast, move out to explore the remarkable temples at Aihole and Pattadakal. Aihole is considered to be the birthplace of Hindu stone architecture. The distinctive characteristics to watch for in Aihole are the Western Chalukyan architecture including mortar less fabrication with stress on length and not on width or height. Roofs are flat with richly cut up ceilings. Overnight at the hotel. Morning after breakfast drive to Goa (approx. 250kms / 05hours). Upon arrival check in at the hotel for at least 04days OR board your flight / train to onward destination from Panji, Goa's Capital.